A few weeks ago, my mom began dropping hints... she lost one of her mittens and couldn't find a new pair she liked. At first, a pin showed up here and there on my Pinterest feed -- but then the hints started to arrive more steadily. Mom wanted me to make her a new pair of mittens. I looked at patterns -- and believe me, there are a lot of good ones out there. But, I couldn't find a nice, simple one that I liked. So, I designed my own. Mom was delighted with her new mittens and suggested that I make some more up to give as teacher gifts. With Little Miss's special needs, we have a support person for just about everything -- so I'm always looking for something that is both meaningful and inexpensive. These people do a LOT of hard work to help my daughter succeed, but if I spend even $5 on each, the numbers start to rack up fast! But a pair of mittens isn't for everyone, so I decided to make this pattern a double-whammy. This download includes not only the pattern for a simple pair of medium-sized women's mittens, but also an adorable, quick-to-make little bear. 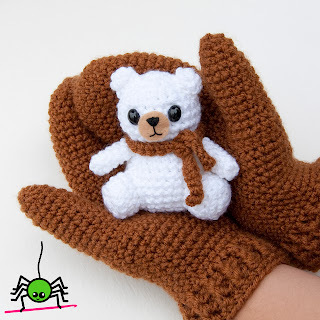 Even though I chose to make my bear and mittens in different colors, one skein of Knit Picks Brava Worsted acrylic yarn is enough to make both pieces -- so the project cost is low too (Brava sells for $2.99 for a skein). The pattern is available for $3.00 through Ravelry and Crafsy. For details on the pattern and purchase options, click here. I hope you enjoy this pattern and it helps fill some stockings or other holiday gift requirements. Happy crocheting!